Our firm is engaged in offering a wide range of Commercial Vehicle Switches for Three Wheeler that are highly durable and long lasting and are of 6 Volt Capacity. The entire range is fabricated from superior quality materials. Our products are manufactured under controlled unit ensuring quality standards. It is of high quality and the maintenance is low. We are providing auto electrical such as switches. We are betrothed in providing the best quality series of Automotive Electrical Switches to our valued consumers. These products are developed under the universal industry norms. Electrical switches for TATA 207, 407, 2010 and school buses. We feel pleased to provide a wide variety of relevant products such as Safety AC Power Unit which is available at budget friendly price. We are a recognized name in providing sturdy and versatile Automotive Electrical Switches in relevant industries. These are quality tested on various parameters like heat and shock resistance, sturdiness and performance. These are manufactured in conformity to set industry standards and are available in various specifications. 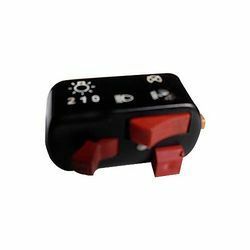 We offer to our customer a wide range of Auto Electrical Switches. We offer a original range of electrical switches for two-wheelers of different models of bajaj & honda. These switches are available of bajaj & honda. The range includes ignition switches, light switches and lock switches. Having high strength & flexibility, these products ensure maximum conductivity and minimum voltage drop. Anupam Industries is a leading Manufacturer of 'Automotive Electrical Switches' in India. The Company's Growth is driven by Highly Experienced Management Team Since last 3 Decades.